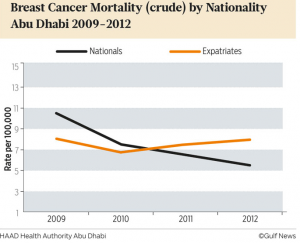 Expats in the UAE have higher mortality rates from breast cancer than Emirati women, possibly due to insufficient insurance coverage. 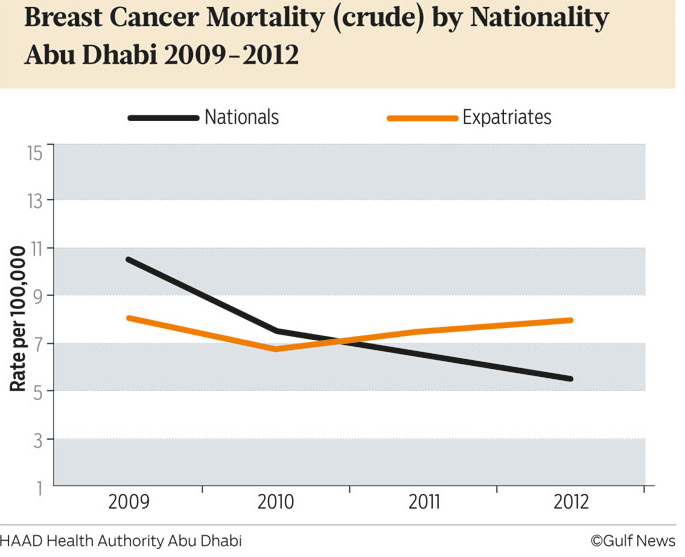 Over the past three years the breast cancer mortality rate among Emiratis has dropped 5.6%. The data, reported by Gulf News, shows an increase in the number of expat deaths from the disease over the same period. This rise in expat deaths has been partly attributed to a shortage of expat insurance plans that cover mammograms and other early detection methods. “These figures are calculated per 100,000 cases, and this is because insurance companies are not covering early detection, including mammograms, as they consider them a luxury and not a must, Dr Jalaa Assad Taher, section head of cancer control and prevention at Health Authority Abu Dhabi (HAAD) told the Gulf News. HAAD’s comprehensive breast cancer programme, aimed at improving prevention, early detection, diagnosis, treatment and palliative care, is partly to thank for the decrease in Emirati cancer rates. It seems this campaign has not had the same positive influence on rates of expat breast cancer deaths. Dr Jalaa also stated that expats are a relatively mobile sector of society and so their movement patterns are often unclear. “We are hoping that our new e-Cancer Notification System which collects cancer screening data and cases, will help us follow up and therefore provide better statistics on expat cancer patients and their survival rates,” she added. Since the introduction of the breast cancer programme there has been a 39% drop in the number of cases detected in their late stage, in both Emirati and expat women. If HAAD continues to work on improving early detection the mortality rates will continue to decrease. For expat women, reading the fine print on their insurance policy and including coverage for breast cancer screening should be considered. Could cyber terrorists target the US health care system? Ghana’s health insurance scheme on verge of collapse?